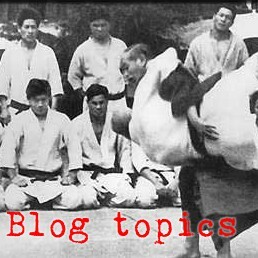 Links to previous articles on The Walk - - nanameashi, wakiashi, tenkanashi, shomen tegatana, soto mawashi, and uchi mawashi. This illustrates an interesting thing about the structure of The Walk - the exercise as a whole is constructed to lull you into a rhythm and then break that rhythm to trick you into a mis-step. This happens often in this exercise For instance, in the three previous pushes, we get into a left-right-left-right rhythm (for 12 beats) and then all of a sudden, uchi soto gaeshi is left-left-right-right. When the exercise changes rhythm, watch carefully for extra footsteps and awkward pauses. Uchi mawashi gaeshi represents pushing with the shoulder. The contact point is not the forearm or hand, but the upper arm or shoulder. This feels to me like the pictures you've seen of olde timey football players turning the arm inward in order to hit with the shoulder. This movement is most commonly seen as representing parts of iriminage or kotegaeshi. 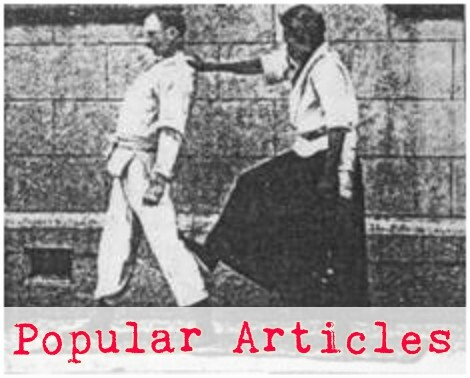 Instead of pulling uke's head to your shoulder in iriminage, try pushing it in an arc back toward your own shoulder. Sounds weird, but uchi soto gaeshi can teach you how to push toward yourself instead of pulling. This motion also illustrates the entire range of motion of the arm all the way from hineri to gaeshi. This sort of motion can be an interesting kuzushi induction - before you contact uke, place your own arm into hineri, then as you get a connection, relax and allow your arm to rebound back to neutral or even into gaeshi - that twist will be transferred into uke's body. This is useful in the tenkan version of kotegaeshi This is similar to the beginning of Koryu dai ni.